Rick Delong waited until late in the late model feature at Oakshade Raceway to take the lead and win his first of the year. Late model rookie Devin Shiels led a couple other first year late model drivers, Brice Luttrell and Chris Smith, early on in the feature race. Luttrell’s good run ended on lap 10 when he spun and brought out the second yellow of the race. Shiels continued to lead over Justin Paxton and Aaron Scott who was driving a borrowed car. Paxton and Ron Price, a lapped car, got together as the leaders were working through lapped traffic. Paxton ended up nose first in the backstretch wall as was done for the night. With Devin Shiels continuing to lead, Aaron Scott and Rick Delong began to put the pressure on in the closing laps. Scott dove under Shiels on lap 22 and slid up and slammed into the side of the 51 car in turn two bringing out another caution flag. Aaron Scott never stopped and took over the lead. Shiels was able to continue but had to restart at the tail end of the field. One lap after the restart, Rick Delong passed Scott’s damaged automobile to take the lead, which he held for the final two laps. Kris Patterson finished second after starting 17th with Brian Ruhlman third. Scott slipped back to finish sixth behind Todd Schroyer and Rusty Schlenk. The sportsman feature event turned into quite a crash fest with an interesting finish and the full moon shining down on the track. Ray Klawitter grabbed the lead early over Mike Jessen and Rusty Smith. After a pair of cautions for spins by Chris Keller and George Laney, Mike Jessen got by Klawitter to take the lead by lap four. Ron Schultz tore up his racecar shortly after the lead change with a crash on the front stretch. Chris Keller anticipated the ensuing restart wrong and plowed into the rear of George Laney as the two were trying to come up to speed near the back of the pack. Joe Derbeck jumped a late race restart, passing before the restart point and would be penalized two positions for each position gained. Derbeck only gained one spot on the restart, but eventually got out in front of the field. Derbeck was the first to take the checkered flag, but the battle for the lead was taking place just behind him as Klawitter and Jessen came together coming to finish line. Klawitter edged out Jessen for his second consecutive feature win. Derbeck received credit for a third place finish after the penalty was enforced. Jeremy Grover and Dale Cole rounded out the rest of the top five. Josh Steinacker led from flag to flag in the bomber A Main to pick up his second A Main victory of the year. The event was slowed by cautions only three times for spins. Billy Ruff finished second ahead of Jake Rendel, Jeff Foks and Dan Bliekamp. Richard Patton led most of the bomber B Main that went caution free. Curt Lancaster closed in on the leader while working through slower traffic and on the final lap, used a slower car as a pick and took the lead and the win, his second B Main win in a row. Patton settled for second with Gary Domoe third. Dennis Laney opened up a big lead early in the bomber C Main with Karl Spores closing in. After a couple cautions, Spores was able to get by Laney for the lead, but a caution for David Goben’s trouble in turns one and two would negate the pass for the lead. Chris Williams joined the battle at the front late in the race, but lost it in turn two after contact with Spores. Spores continued to put the pressure on Laney and on the final lap got to the inside of Laney as they came to the checkered flag. Laney held on to win by a very slim margin over Spores. Dan Bronson and Steve Dempewolf finished third and fourth respectively. 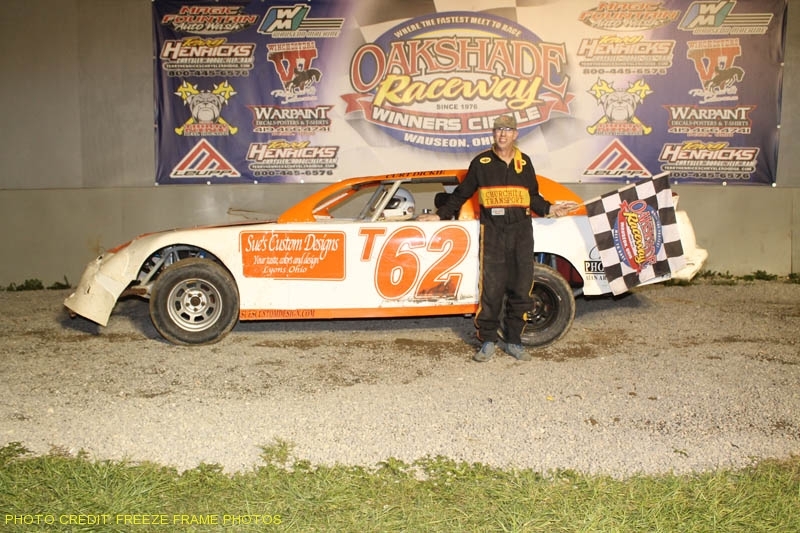 Saturday, August 7 marks the third visit by the American Late Model Series presented by Sunoco to Oakshade Raceway with the feature paying $2,000 to the winner. Sportsman and bombers will also be back in action.